Well, after a marathon of bureaucracy resulting in the best marriage contract-signing photo ever, we got married on February 17, 2016. Our day started with picking up our witnesses, two of Layth’s friends, and all meeting at Sharia court in Wadi al-Seer, which is in an extremely nondescript building that I only managed to find again because I recognized a guy selling bananas one street over. Tomorrow is our katb al-kitab day. Big inshallah that everything goes according to plan and no one decides some part of our paperwork is wrong. 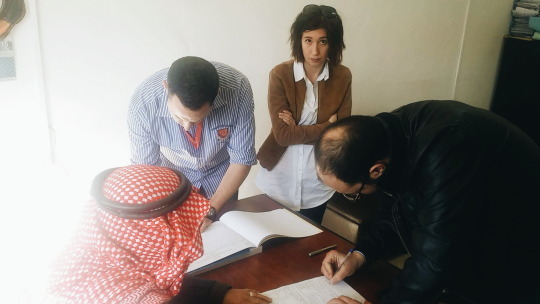 For lots of Jordanian couples, katb al-kitab is the “engagement,” but it is a marriage contract, and after it’s done, you’re legally married. So even though our wedding isn’t until July, after tomorrow, we’ll be married. To each other. Between work and running around getting documents stamped, I haven’t really had time to freak out about the fact that it’s my last day as a free woman. Joking. Since Layth’s mom and I spent a lot of time trying to figure out what offices we needed to go to, and since we accidentally went to divorce court instead of marriage court, I’ll write what we did here, since I’m not the only foreign woman out there getting married here. 1. A letter from your embassy stating that you’ve never been married, and if you’ve been divorced, you’ll need proof of that, too. The US embassy doesn’t keep centralized records of marriage, so when you go to the embassy, they will only give you a very generic letter stating that they can’t give Jordanian authorities proof that you’re not married. So far this letter has worked for me, as the half-asleep civil servants who stamped it didn’t even read it. However, other women I know have had the letter rejected, went back to their office and had a colleague type up a “proof” letter stating she was single, and had two witnesses sign it. Somehow this was accepted. Others were skeptical of the embassy letter and made her swear up and down that she was not already married. I think it depends on the mood of the employee you get that day. This letter has to get stamped by the Ministry of the Exterior (Shmeisani) and the Sharia Court (Gardens). 2. Translation of your passport into Arabic. After a lifetime of battling with people not to pronounce the silent R in my last name, the guy at the translation office insisted that spelling it phonetically, as it would be pronounced in French, would raise red flags. I wanted to tell him I have relatives named “Thibodeaux” – how would you transliterate that, I wonder? Oh well. At least the Arabic pronunciation sounds nicer than the American version. 3. Blood tests for you and your fiancé. They check for Thessalemia and HIV. I hear a lot of people complain about how the Ministry of Health basically doesn’t look nice and they’re afraid they won’t get a clean needle, but there are plenty of very modern looking, very clean medical labs where you can get any number of tests done for a reasonable price (seriously, like $10). These tests have to get stamped by the Ministry of Health. 4. Defter al-’aile (family book). This is basically proof of the Jordanian partner’s marital status, lists his immediate family, place of birth, etc. Since Layth’s parents are divorced, his father has this paperwork, so Layth had to go to the Civil Status and Passport office to basically get a substitute copy.